Cap City Stunts is an amazing Stunt Team that offers the best in entertainment for any event. They started out performing at Home & Garden shows and School Assemblies in April of 2006. Since then they have sky rocketed to be one of the most respected professional stunt teams in the world. Cap City Stunts philosophy is based on keeping things simple an being self reliant in order to be able to provide their services at a fair price. Cap City Stunt Team is based out of Sacramento, Ca but has teams through out the U.S., Spain and Finland. They provide positive message assemblies for schools through out the U.S. and Canada and always do what they can to provide the best performance. Each of Cap City's Stunt riders are well taken care of and have the best reputation with the BMX community. Each stunt rider is dedicated to giving the best show you will ever see. 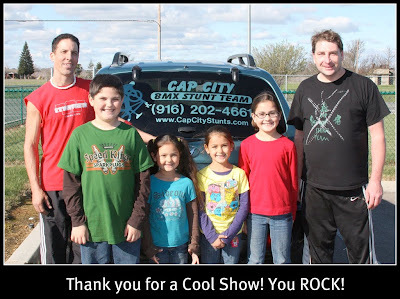 ★ I had the opportunity to see a great performance from Cap City Stunts at my kids school. It was reward day for the kids. All who had good behavior and reached their AR goals were able to go to the show. They were all very excite. Rick De Laney is a great speaker and made the show very exciting with music, stunts and sharing with us what the other stunt rider, Pete Brandt was doing. I loved how they started out their show. They picked 2 kids out of the audience and had a break dance dance off. It was so fun. We have one talented kid in that area and he was picked. It was too perfect. That was a great start for the kids watching. After the dance off each of the kids got a poster. Very cool. Then on to the amazing stunts performed by both Rick and Pete. The best part as a mom was listening to Rick talk about how to react to bullies and to make sure you follow your dreams. My son in particular was having trouble in these areas lately and I was very impressed with what my son got out of it. Honestly he really is looking at the teasing differently. He doesn't care as much. Thanks RICK!!! Then it was on to more fun stunts. Including a stunt that included 4 of our teachers. That was so fun for the kids. Pete jumped across the teacher as they lay out on the ground. Very, Very cool. After the show they stayed and signed autographs for the kids. School Assemblies ~ packed with exciting music, cool BMX bikes, exciting BMX stunts and great positive messages. Teaching kids to follow their dreams, to stay drug, alcohol and tobacco free. Special Events ~ Fairs, Festivals & Community Event Entertainment. Private Parties ~ Make your birthday party, block party, mitzvahs or other special party an unforgettable success. Bicycle Rodeos ~ comprised of an obstacle course that mimics "real-life" situations. Students practice avoiding road hazards, scanning for automobiles, correct riding techniques, bicycle safety checks, and intersection safety. Additionally, students and parents learn how to properly fit helmets. Wow. My fist thought is a good umbrella insurance policy. :-) It looks like you had a nice time and isn't it amazing the different things the human race can do? I think bike stunts are so cool.